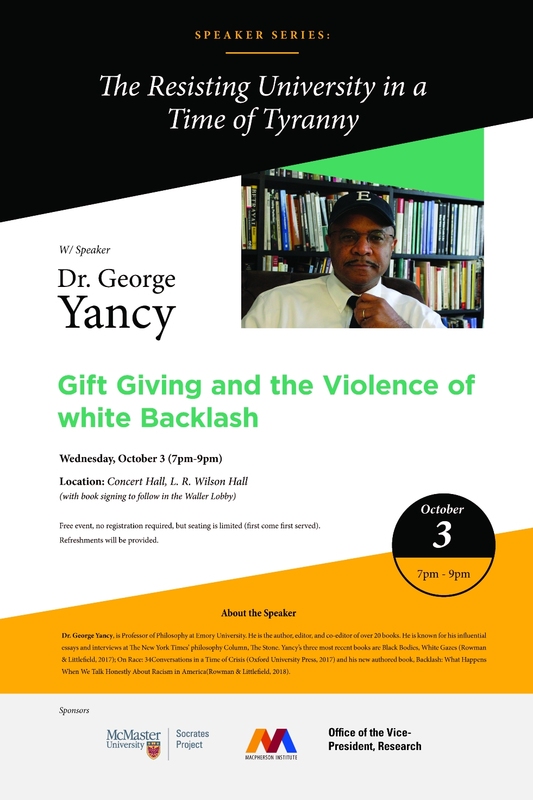 On Wednesday, October 3, 2018 join George Yancy –professor of philosophy at Emory University, author and New York Times contributor – for his talk, Gift Giving and the Violence of white Backlash. Abstract: In this talk, I will explore truth-telling as an act of gift-giving. I will frame this talk within the context of my “Dear White America” letter that was published in The New York Times’ Philosophy column, “The Stone,” on Christmas Eve, 2015. I will expose the reactions to the letter and explore how they reflect a deeply embedded white racist imaginary. I will also show how the racist violent discourse and imaginary are indicative of our current political and ethical crisis in North America. I argue that resistance to whiteness, which I see as part of an embedded racist structure that is both social and psychological, implicates what I call an ontology of no edges and thereby an ethics of no edges. Hence, I argue against the ontology of a neo-liberal self as opposed to a self that is always already touching. In this way, I argue that whiteness must un-suture, must fall apart, as a means toward laying claim to a different humanity. Dr. George Yancy, is Professor of Philosophy at Emory University. He is the author, editor, and co-editor of over 20 books. He is known for his influential essays and interviews at The New York Times‘ philosophy Column, The Stone. Yancy’s three most recent books are Black Bodies, White Gazes (Rowman & Littlefield, 2017); On Race: 34 Conversations in a Time of Crisis (Oxford University Press, 2017) and his new authored book, Backlash: What Happens When We Talk Honestly About Racism in America (Rowman & Littlefield, 2018). The Resisting University in a Time of Tyranny Speaker Series is made possible by an endowment from the Office of the Vice-President, Research. The talk is co-sponsored by The Socrates Project, Paul R. MacPherson Institute for Leadership, Innovation and Excellence in Teaching.